ThermalTake introduces the TT eSports Black Element Cyclone Edition. The peripheral is similar to the previous Black Element, including a "military-grade coating" and a 6500dpi laser sensor engine. The difference is the inclusion of a small USB port on the top, for installing the bundled 6,000rpm fan to cool your sweaty hand. The Black Element Cyclone Edition is hardly the first gaming mouse to include technology designed to cool overheated users, but the removable nature of the fan may make it more popular than most - although we'd recommend not stretching your fingers out and poking the blades. Despite the fan's swift rotational speed, Thermaltake claims a whisper-quiet 21.7dB noise level and an impressive airflow of 2.6 cubic feet per minute. As with the Black Element before, the Cyclone Edition also includes five 4.5g removable weights in the base, allowing gamers to customise the heft according to their individual preferences. The glowing parts - de rigueur for any gaming mouse - can also be customised for colour. 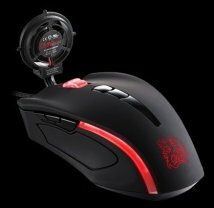 The mouse has a MSRP of $80.